Enlisted on the 24th August 1914 as a Sub-Lieutenant in Royal Naval Volunteer Reserve, Hawke Bn. R.N. Div. (Antwerp). Hawke Battalion Interned in Holland 9/10/14. 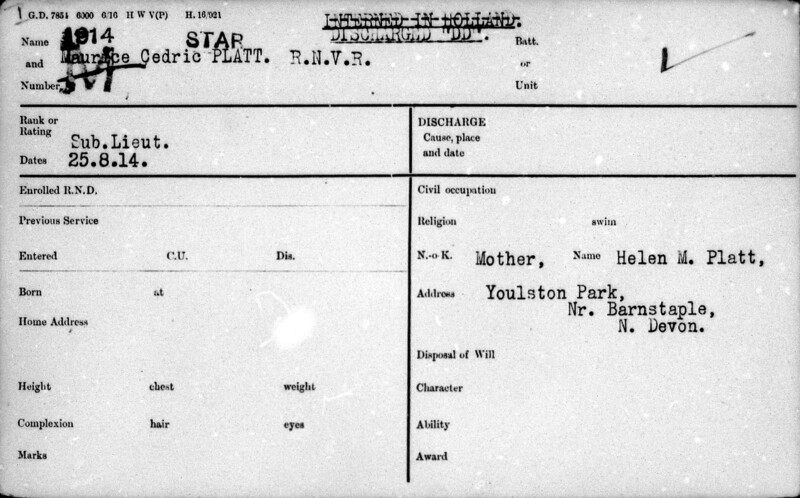 Leave to England from 9th May to 9th June 1916 (his brother John had been killed at Ypres on 27th March 1916). 27.11.1918 Report received Sgravenghe. Died at the Hague, Holland 26.11.1918 from Heart Failure following Pneumonia. Buried at OLDHAM (CHADDERTON) CEMETERY, Grave Ref:K8. 41. PLATT Maurice Cedric of New-place Sunningdale Berkshire died 26 November 1918 at the British Legation The Hague Holland Probate London 9 May to Helen May Platt widow Alice May Brownlow (wife of the honourable Francis Cecil Brownlow) and Herbert Hodder Roberts major HM army. Effects £231,874 17s 4d.